See original article on palsolidarity.org. Israeli settlers attacked and chased a group of Palestinian farmers last Thursday, causing a tractor to flip over during the chase, causing the death of the Palestinian driver. On Thursday, April 5th, armed settlers from the illegal Israeli colony of Itamar attacked a group of Palestinians en-masse. In haste and in fear for his life, twenty-eight year old Fadi Abu Zeitoun’s tractor tipped and crushed him as he fled from the pursuing settlers. The villagers who own olive groves near Itamar rarely get “permission” from the Israeli District Coordination Office to access their own land. During the harvest season, they are permitted a few days, but in the spring when the land needs to be tended they have more difficulty acquiring permission. During this spring harvest, the villages of Hawarta, Yanoun, Aqraba, and Beita were told they had only four hours to access their land. The area to be tended is approximately 1000 dunums so the villagers collected forty tractors to work as much land as possible in the shortest possible time. Israeli activists from the movement Peace Now, and a group of international activists were present in solidarity. Prime Minister Salam Fayad joined them to make a statement re-affirming their right to utilize the stolen land that they were standing upon. 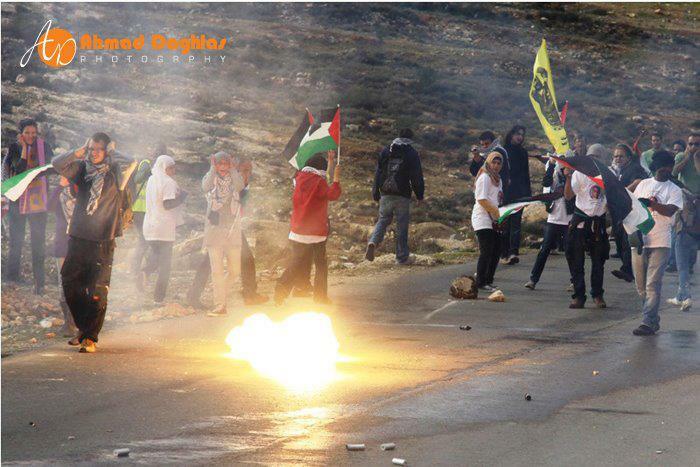 During the Prime-minister’s visit, Israeli authorities were positioned nearby and prevented the settlers from passing. However, shortly after Fayad left the area, Israeli soldiers permitted a mob of settlers to converge upon the Palestinian farmers tending to their land. They began by throwing stones, causing the group to separate and begin descending the hill. The settlers then proceeded to fire M-16 assault rifles in the direction of the unarmed farmers before releasing dogs. In the ensuing chaos, and as Fadi desperately attempted to escape, his tractor flipped over and fell on him, mortally wounding the young man. Palestinians witnessing the incident ran back towards the scene to offer assistance. The settlers promptly dispersed as they rushed him down the hill to the road, unfortunately he was already dead. On the same date, twenty-four years ago, two men from the village of Beita were also murdered by settlers from Itamar. In the gathering following the funeral, Fadi’s father, Sleman Abu Zeitoun, sat with his head down. 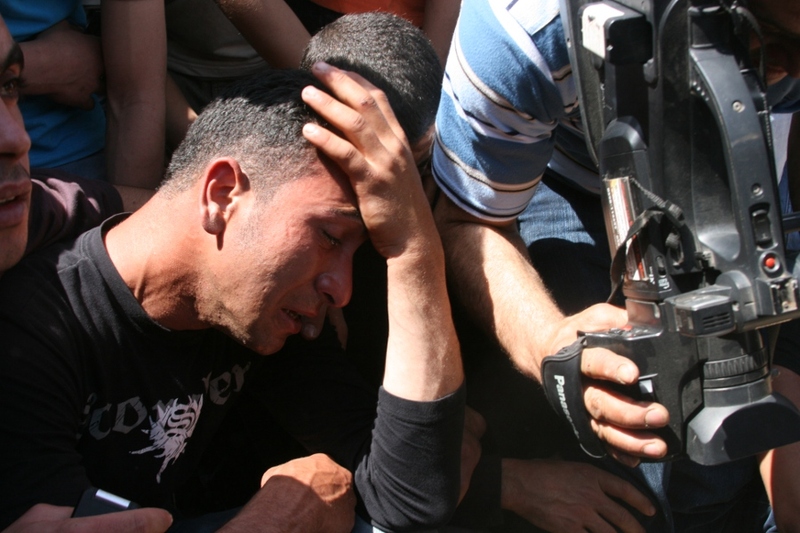 Beside him sat three other men who have had a son murdered by Israeli soldiers or settlers. Fadi was newly married to nineteen year-old Fida’ Bani Shams who is left widowed and six months pregnant. Her brother was killed at the age of sixteen by Israeli soldiers during the second intifada, and as her father says, “She has lost a brother and a husband so what can I say of her emotions? She is in grief. She is exhausted.” Fida’ sat slouched in a corner of the room, her eyes closed and blankets covering her feet. Fadi’s sister has had a nervous breakdown since the death of her brother. She does not recognize her husband or her daughters. Their mother, Mona Fihmeh says, “in terms of how I feel, I have patience, but my back has been broken from the burden.” Mona spent last night praying over her feverish body, and today she sent her daughter to the hospital. Her husband was on the way back from a funeral in Jordan when the accident occurred. He returned to Beita to find that his son had been killed. 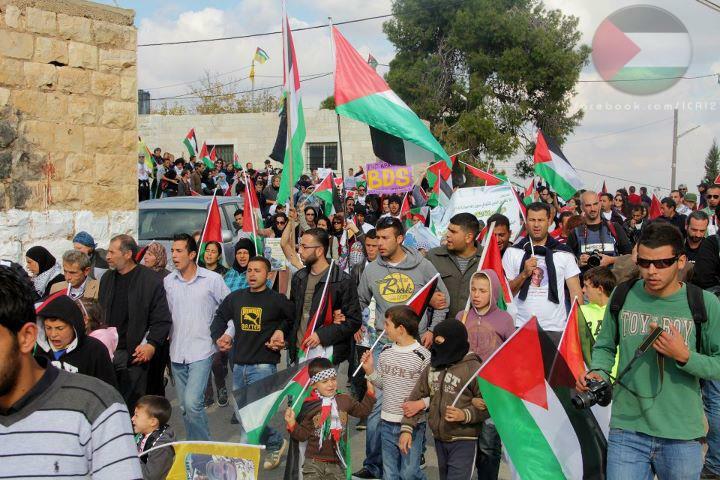 Throughout the funeral, political talk arose about the various results of Israeli occupation and apartheid on Palestine. At first, the unemployment rate among Palestinians does not seem relevant to the death of Fadi Abu Zeitoun, but one soon realizes that Israel’s apartheid policies are to blame for both the impunity with which settlers are treated, and the numerous other negative consequences on livelihood. “Our steadfastness protects our land,” another proclaims. Rana H. is a volunteer with International Solidarity Movement. 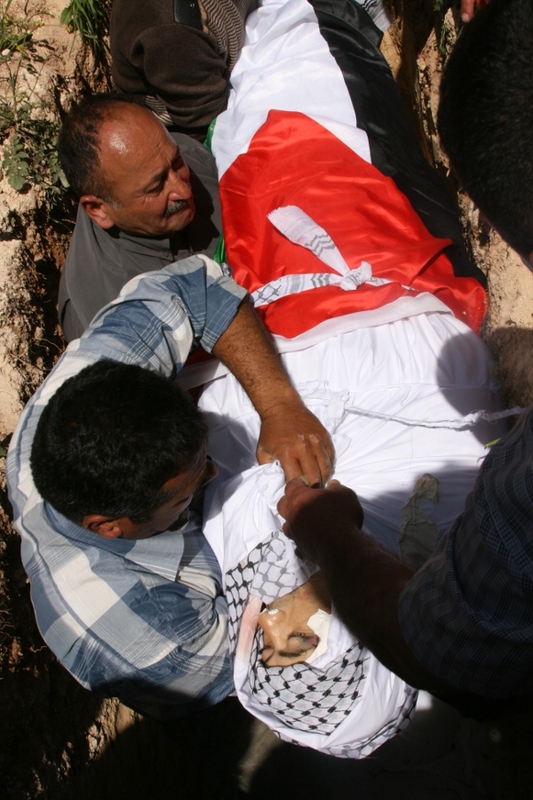 Yesterday was the one-week anniversary of Mustafa Tamimi’s death. 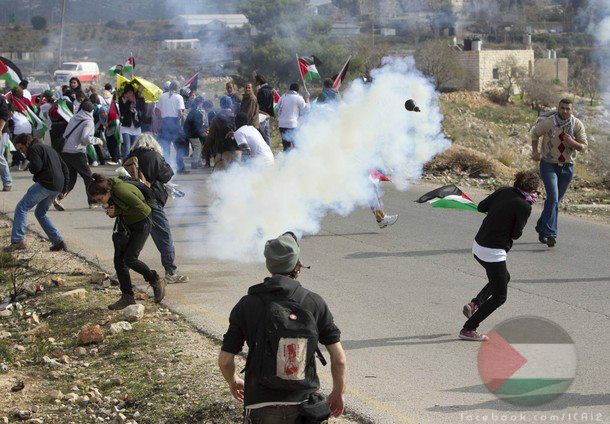 The weekly protest in Nabi Saleh was going as usual last week: Israeli Occupation Forces (IOF) were responding to peaceful protesting with, among other weapons, tear gas canisters aimed like large bullets. The difference is that last week they didn’t miss. Mustafa was shot from a few meters away directly in the head. Two days later, IOF arrived with mourners at Mustafa’s funeral and began to fire the same tear gas projectiles only a few minutes after the funeral. The day ended with soldiers violently attacking us when confronted about Mustafa’s death, and arresting several. This week was no better. Car after car packed with people began arriving in Nabi Saleh from as early as 8am to avoid expected Israeli checkpoints. People wanted to commemorate Mustafa’s death. A bus arrived full of Israeli activists. By noon, everywhere I looked I saw Palestinian flags and keffiyehs. As the protest left to confront soldiers at the entrance to the village, I headed in a car with others to the entrance of the illegal Israeli settlement Halamish, which along with annexing land has claimed Nabi Saleh’s only fresh-water spring for themselves. We wanted to make ourselves shown wearing t-shirts bearing the face of Mustafa Tamimi. Other cars showed up with the same idea and at the entrance to Halamish, some ten people sat down peacefully just in time for three Israeli jeeps to arrive. Soldiers jumped out raid-style and began to arrest everyone they could get their hands on, but particularly those that were sitting, doing nothing other than sitting. There was no warning or threat – just a quick and violent arrest. It happened quickly. Women were desperately trying to hold onto each other, screaming and shaking from shock. Others were being dragged away, handcuffed, and gathered on the sidewalk. An older woman was screaming as four soldiers attacked her for arrest. I was torn between being a photographer or partaking, but as I kept going back and forth a commander recognized me from last week’s struggle and came directly for me. I tried to resist but they began to drag me, then another soldir came and grabbed one leg. I was piled with the others infront of a jeep. When I stood up, a soldier tried to push me down but I dodged him. I rushed back to see my friend from England was being grabbed by a soldier and was really panicking. I held her thinking we might resist arrest, but we were in a sea of soldiers, and instead they handcuffed me and her and stuffed us into a military jeep. Inside we were met with the older woman and soon after by an Israeli girl and Mohammed Khateeb who had just been attacked by an Israeli settler who had stopped. 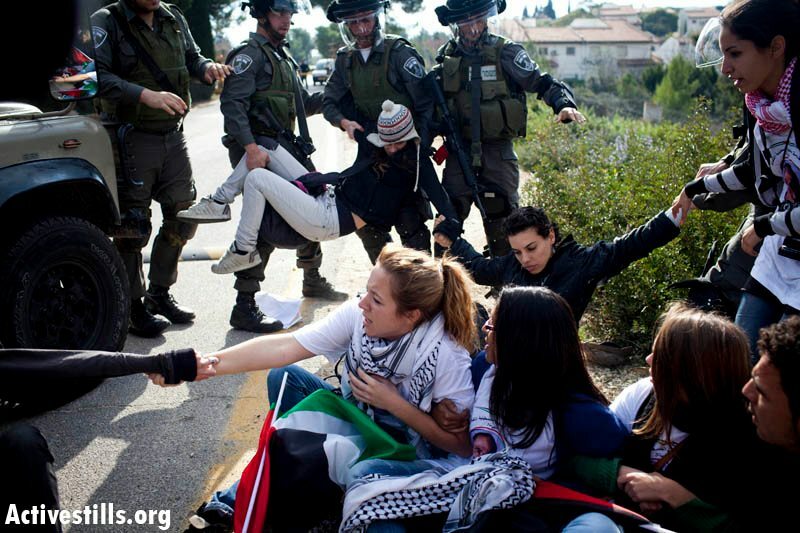 Of course soldiers arrested us for sitting, and not the settler for actual violence. In the jeep there wasn’t enough room for us. Mohammed Khateeb was lying on the floor handcuffed and the soldier suggested the Israeli girl sit on a bucket full of tear gas canisters. She refused and brought our attention to the bags and bins full of weaponry and ammunition at the back of the jeep. There was no woman soldier in the jeep with us. We were driven deeper into Halamish, and stopped outside a military base. Soldier men and women were walking around, some curious, most just laughing and making fun of us. None of them could look you in the eye for more than a couple seconds. A soldier opened my purse and pulled out my camera. I tried to stop them but was just shoved around between the many soldiers that were there. They pulled so hard on my arm that the plastic-tie handcuffs came loose and they had to redo it, this time behind my back and so tight that my hands instantly started swelling. Meanwhile the same soldier that had attacked Khateeb had stopped his car infront of us. A man and his son. Soldiers didn’t interfere as he came up to us and began to take photographs of our faces. 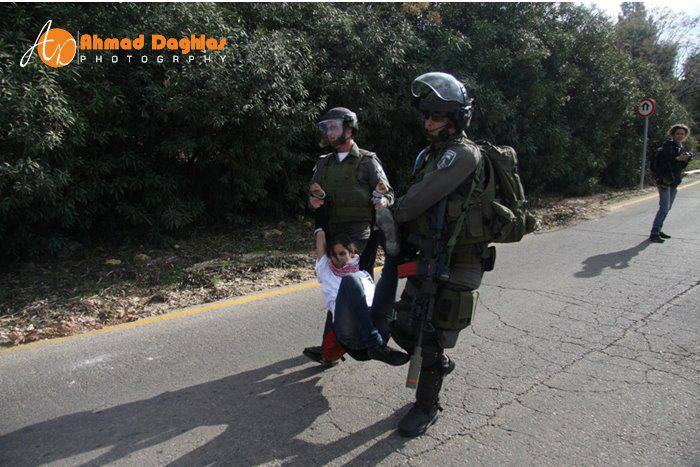 The Israeli girl stood up infront of him and he slapped her across the face, knocking her back. This infront of at least ten soldiers. No one stopped him or arrested him. We began to chant the numbers of his license plate so we could later file a charge: 44322, 44322, 44322….but if history teaches us anything he won’t be charged. The soldiers let us know we didn’t have the right to get angry. Khateeb was being pressed against the stone stairs by two soldiers. One soldier had his hand around Khateebs neck, and I tried to put my leg inbetween his head and the stones. Soldiers picked him up and threw him to the ground face-down. They were pulling at his arms, which were handcuffed underneath him. “I’ll give you my hands by myself!” He screamed repeatedly in Arabic, English and Hebrew. It went on like this, leaving him with blood on his face and arm and dirt on his cheeks. I was thinking how he has such a warm face, wrinkles around his eyes and often smiling. Later on they would say he assaulted a soldier. I don’t know when this allegedly happened, him being in handcuffs the entire time. I do know that 99.74% of Palestinians tried in Israeli military court are convicted and that just the word of a soldier is proof. We were taken to a room where we met a few others. Nothing was said to us, and we waited sitting on old cushions and mattress-less metal bed frames for hours. The entire time we were handcuffed. If your phone rang, a soldier would take it away. If we talked too loud, soldiers would interfere. The windows didn’t close and as the hours passed, we began to huddle together for warmth. When we needed to use the bathroom, we were told to wait. After half an hour, they started to take one person at a time to a bathroom outside the building, about a 10 minute trip. There were 23 of us. 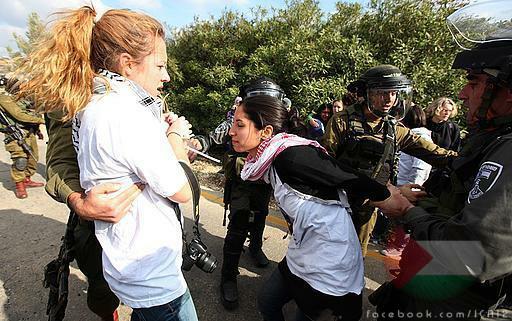 Arrested we were 23 people in total, including 7 Palestinians, 12 Israelis, and 4 internationals – among them 12 women. 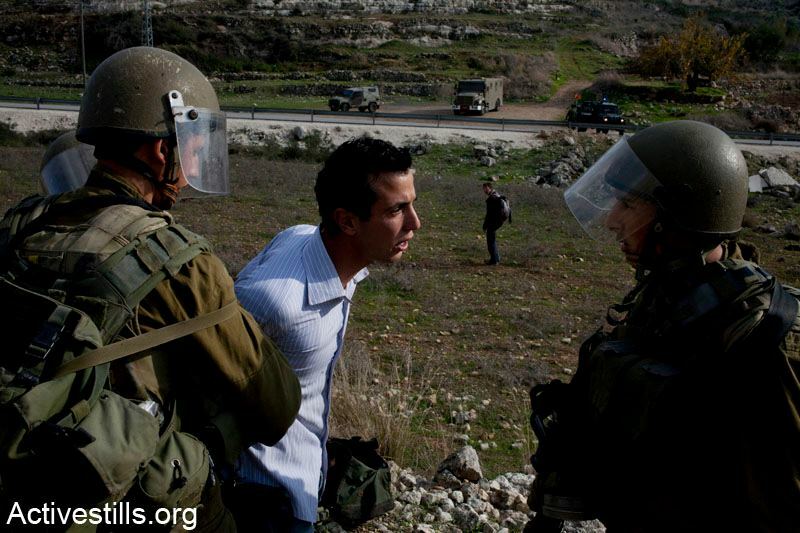 Among them was Mohamed Tamimi, a young man my age, braces still on and resembling his late cousin, Mustafa Tamimi. Everytime he walked into the room he would put his cuffed arms in the air, resembling the famous picture of Marwan Barghouti. We would clap for him. He was pacing most of the time, red eyed. He was going to be charged with stone-throwing, which could land him 6 months. He doesn’t throw stones, he photographs and reports. He kept trying to talk to the soldiers – You killed Mustafa, isn’t that enough? How can you sleep at night, I just want to know….How can you sleep? The older woman that was arrested with us had a ring of purple bruises around her upper arm and her entire arm was numb. We requested a doctor. Half an hour later, a medic-soldier came and did nothing but accuse her of making it up. I flipped out when he said it! She got to see a doctor after an hour of waiting, but nothing came out of it. The entire time we were in Halamish we didn’t see one soldier or officer that spoke Arabic. Can you imagine if you were a Palestinian arrested alone without anyone to advise you not to sign or say anything – everything was done in Hebrew and if those among us didn’t translate, no one would have. We were in Halamish for 9 hours. They filmed us while our charges were read in Hebrew, one by one. They searched us, took away everything except our money, and escorted us to the bus, one by one. When everyone was on the bus they started to call people, one by one, to have their charges read to them in Hebrew. Mohammed Khateeb translated. Most of us were charged with entering a closed military zone, then refusing to leave when asked. Do you have anything to add? no I replied. Do you want to sign? no. We were not in a CMZ and were never asked to leave, but had we signed, we wouldn’t have gotten out. The bus drove to Benyamin Gate police station, with soldiers posted at the back and the front. They had taken our belts, and I wanted to tie a scarf around my waist: it took me about twenty minutes to manoeuvre with the handcuffs on. In Benyamin we were piled into a tiny room, some of us sitting on tables or the ground. 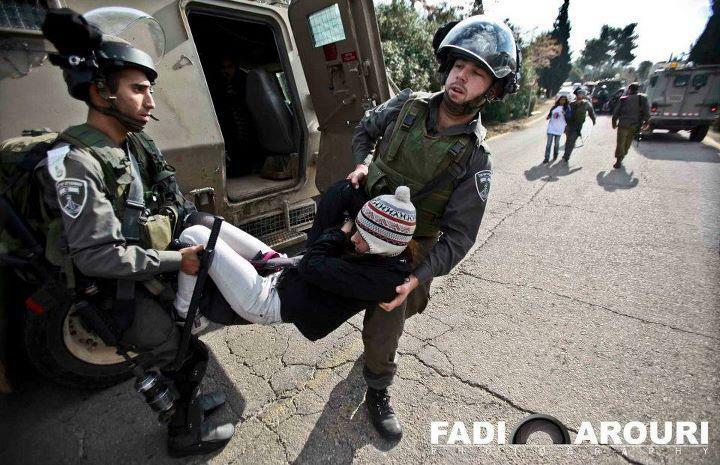 Everyone had their handcuffs removed except Mohammed Tamimi. The smokers were still denied to smoke, and honestly this was the biggest object of stress in the room. At one point, soldiers agreed, then changed their mind when they reached outside. Taunting. We had been arrested for 10 hours before a soldier walked in, and threw a box of food on the ground. Before, two Israeli activists had come around giving everyone one bite of the food they happened to have. Inside the box was some fruit, several loaves of white wonder bread, a hundred small packages of chocolate spread, and two huge bags of yogurt (which remained largely untouched…). In Benyamin they began to take Israelis and Internationals for interrogation. Two hours passed and finally an officer who spoke Arabic came. He dealt with me and the four other Palestinians excluding the two Mohammeds with worse charges. As we walked by some officers, shivering, one of them looked at us pitiyingly and asked – did they get food? How ridiculous that these people, the backbones of the Israeli occupation, like to play the “humanitarian”. Am I supposed to thank you? My people wouldn’t be imprisoned if it weren’t for people like you. They may try to ease their conscience with small gestures, but until they put down the gun and stop invading our lands they must carry the responsibility on their backs. An hour later, at almost 1 am after over 12 hours, he told us that he was going to do us a ‘favour’ and let us go. We received our belongings in plastic bags, and weren’t allowed to say bye to the people we left behind. Mohammed Tamimi and Mohammed Khateeb were eventually transfered to Ofer prison. Throughout the night they joked that they would send our Salaams to Bassem Tamimi, a prisoner from Nabi Saleh. Somehow I thought that they would find a way to get out of the mess, but in reality there are thousands of Palestinian prisoners in Israeli jails. 800,000 Palestinians have been arrested and detained. 30% to 40% of the population have been in prison and between 3 and 4 out of 5 Palestinian men have been in prison. Why would these two be any different?